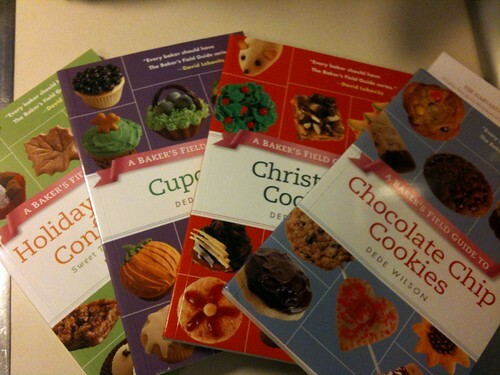 As I mentioned in my last post, the very generous folks at The Harvard Common Press sent me four cookbooks (Chocolate Chip Cookies, Christmas Cookies, Cupcakes, and Holiday Candy & Confections), all part of the Bakers Field Guide series. All of the recipes are easy to follow, have pictures, and sound delicious! If the Half Chocolate Chip and Half Chocolate with White Chip Cookies are any indication, I’m in for a real treat with the next recipe I try! For your chance to win a set of these fabulous cookies, leave a comment telling me what your favorite holiday (Halloween, Thanksgiving, or winter holiday) treat is. Stale Peeps in the shape of ghosts is a perfectly acceptable answer. Also, to those of you celebrating–Shana Tova! May you have a happy, healthy, and sweet new year! Giveaway ends at 11:59 p.m. EST on Sunday, October 2, 2011. One winner will be selected at random shortly thereafter and contacted by email. Please note this contest is only open to residents of the U.S. and Canada. I LOVE Christmas! It’s when all my sisters get together and cook! The Winter Holidays are my favorite time of year to bake! I was a winner last year with many of your recipes! Cobblestone Brownies were made for pretty much every party and treat gift! I make pizzelle cookies every year with the iron that my grandmother left to me when she passed away…very special. My favourite holiday is Thanksgiving. Here, in Canada, the holiday is in early October and usually happens at the same time as my husband’s birthday on the 8th. The weather is almost always wonderful and our two children usually can travel to our ranch for celebrations. We are most thankful, always, for each others love and presence in our lives and we always have a great party for Husband/Dad. My daughter usually brings the birthday cake and it often is made of pumpkin – pumpkin cheesecake makes a fairly regular appearance and is much appreciated by all. Chocolate is loved by us all and Husband/Dad is often gifted at this time of year with chocolates – chocolate covered raisins are his favourite. I love Christmas and for some reason, I equate this holiday with any kind of treat from See’s Candies. My grandmother always splurged on a box at Christmas, and I remember rushing to find a good piece in the nuts and chews variety. Sweet memories! For some reason my family always has knishes on Thanksgiving, and that’s my favorite thing! Absolutely homemade, hand decorated sugar cookies at Christmas! Huzzah for a contest open to Canadians! I looove Halloween, but Christmas is my favorite. Family, Food..everyone is so happy and joyous! Latkes at Chanukah. But my grandmother’s sweet potatoes for TG are a close second. L’shana Tovah! Thanksgiving is my favorite because my Mom cooks the traditional American meal Mexican style and she makes plenty to have leftovers the next day. Red velvet chocolate chip cookies are always a hit with my family and friends! I love pumpkin whoopie pies during Thanksgiving. It’s a twist on a great classic! I love Thanksgiving best. It’s all about family and food. What could be better. That’s a toss-up between everything pumpkin for Thanksgiving and all of the See’s Easter treats! My most absolute favorite holiday is Israeli Independence Day. We get together with friends and family in a public park and have one huge cookout! Everyone brings food and we all share in the yumminess of it all. My favorite treat that day is the American style all beef hot dogs that we buy from a kibbutz up north. They grill up juicy and yummy and I just love eating them bunless with lots of spicy ketchup for dipping. I usually avoid hot dogs during the year but on Yom Ha’atzma’ut, I really look forward to these babies. I love Thanksgiving! So much to be thankful for – family, friends and good food! My favorite is Rosh HaShana. Its a time when we come together, and its usually close to apple picking time. We all go apple picking, and collect many bags of apples, and then come home to the ” why do we always get so many” feeling- and then we start, first with the applesauces, the apple cakes, then move onto apple galettes, and finally a nice chicken recipe with apples and honey. Its a job, but totally fun as we all laugh and peel together. My favorite holiday treat are the pumpkin chocolate chip cookies that my Dad makes every year. He makes the first batch before Thanksgiving and the final batch for New Year’s Day–I won’t divulge how many batches in between. They are the family favorite after all! My favorite holiday is Thanksgiving and it has to include my Mom’s sweet potato casserole with pecan crumb topping……no marshmallows! Thanksgiving is my favorite holiday. I know that my son will be home from college and my whole family will be together. We always look forward to some homemade dutch apple pie. I love spritz cookies! When the cold air comes, I start dreaming about putting way too much almond extract into spritz dough and turning it green! Thanksgiving is my fave. It is all about the food and getting together. Thanks! I love gingerbread men at christmas! Christmas gets my vote! Every year I make a gingerbread trifle that is to die for. How can you top gingerbread, cinnamon custard and chocolate sauce?? Amazing. I love Thanksgiving. I love the food and spending time with my growing family! As weird as this is going to sound, I absolutely love my dad’s fruit cake. It’s super moist and slightly fluffy. Unlike the rest of the world, my family loves getting this treat from my dad! I love ANYTHING with pumpkin in it. My personal favorite would probably be pumpkin swirl brownies though. My favorite holiday treat is Gingerbread cookies! So good! Gingerbread cookies! I was going to say anything with pumpkin, but really I love anything with spices. And gingerbread has all the warm spices of pumpkin desserts, plus even spicier ones like black pepper. And I heart molasses! Broken glass torte made by my now 91 year old grandma! We get to do holidays 3 times…once with my family and twice with my husband’s. Everyone loves my pumpkin log filled with cream cheese frosting at Thanksgiving! I think I would have to say peanut butter balls and grandma’s old fashioned fudge – I know they don’t sound particularly like holiday treats but my mother and grandmother have always made them for Christmas and Christmas just wouldn’t be right without them. I’ve now continued that tradition for my family at Christmas. Wild rice stuffing. I dream about the stuff and then gorge come Thanksgiving. Christmas has to be my favorite baking holiday! Thanks for a great giveaway! As a holiday, I’d have to say it’s Christmas. But I bake all the time, so I don’t really need a holiday to enjoy. I probably back 2-3 times a week. My favorite holiday treat would be the spritz cookies my mom and I make. There is cream cheese and lemon peel in the dough – oh my gosh, so good! Jam thumbprints rolled in coconut for the Christmas holidays. Oatmeal Cookies with Coconut and Dried Cherries. Having just finished rosh hashanah, my favorite treat is honey cake. or apples and honey, or anything honey related. I love Sukkot when we get to eat together outside as a community. Second best is the winter holidays as I get to share my baking skills with friends and family. My favorite treat is pecan pumpkin pie for Thanksgiving!